Anthony Wallbank is a friend of several members of Ontario’s Amish community, and drove some of them to the Island to look at farm properties. Wallbank said many younger Amish men are looking to start up their own farms, but affordable, fertile farmland is scarce in Ontario. On P.E.I., he said, there’s lots of land at a tenth of the price. With all due respect to our Canadian readers, I don’t really know much about Prince Edward Island. According to government statistics, the province of Prince Edward Island has around 140,000 residents. Wikipedia tells me the province consists of one main island and 231 smaller islands, with the main island about the size of Delaware. 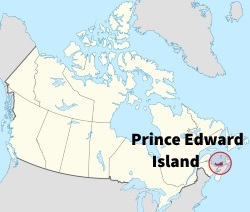 Prince Edward Island is by far Canada’s smallest province by land area and is the 4th smallest by population of the nation’s ten provinces and three territories. I’ve never heard of Amish living in this area. In fact, the only other Canadian province besides Ontario I’m aware of where Amish have lived (briefly) is British Columbia (if you know of any other, glad to hear about it). Wallbank said he will likely return to P.E.I. with another Amish group next month, and he would not be surprised if a handful of families move to the province within the next couple of years. Interesting! I wonder what community in Ontario they are from? I have not seen anything in The Budget or Die Botschaft about this. Good question Mark, maybe we’ll hear more if there’s a follow-up article. Several parcels of land near Cardigan in Kings County PEI, have been purchased by two Amish communities from Ontario, the communities are from Norwich and Millbank. Here is the link. I also heard mention of them coming at the feed store. I have no idea, but I’ll be watching the comments keenly for updates. This is a cool way to start the week. If I am not mistaken a few Aylmer Ontario Amish had looked at land on PEI many years ago. The Orthodox Mennonites, a group of ultra conservative Mennonites from Gorrie, Ontario, who are often mistaken for Amish,were actively checking out settlement possibilities in Quebec several years ago. The political climate did not suit most of them so a few were also investigating PEI at the same time. The Orthodox Mennonites have now started a settlement at Douglas, Ontario, not far from our community, just west of Ottawa. Interesting story Osiah. It must be limited if that was a concern. I can see the benefit of Amish or Mennonites arranging multiple transactions at once and without a lot of fanfare, especially if a number of families are known to be moving. In a sense they are at a disadvantage in the market, if it is known by sellers that Amish want to live near other Amish, and in fact have to live within a certain limited range if they want to be a part of a given church or settlement. However that might be offset if those selling the land had an active interest in getting an Amish settlement started in their community. The effect on land prices of Amish or Mennonites moving into an area would make an interesting study; there might even have been something done on this already which I’m not recalling right now. The ultra-orthodox Jews, who must live within walking distance of a synagogue, have similar real estate issues. They prefer to dwell in urban settings. But as anyone who’se been around Lakewood, NJ, or Kiryas Joel, NY, or a number of neighborhoods in Brooklyn, NY, knows, once Haredim Jews start to move in, real estate prices zoom upwards. For the Amish, I imagine the trend might be even more pronounced, because urban real estate can be made more denser much easierr than rural real estate. So I wouldn’t broadcast too much that the Amish might be looking to buy real estate on a small island. On the other hand, i have thought that buying land near an Amish settkement would be a wise investment choice. As would buying urban real estate in an newly created eruv. Nice example Ed. I did not know that they needed to be walking distance from a synagogue. Two families from the conservative religious group in a settlement near Stratford, Ont., went to Prince Edward Island last week to check out farmland on the east coast, where land is 10 times cheaper than here. “It’s night and day. Land prices here are $15,000 to $20,000 an acre. That’s unaffordable for a mixed-use farm operation,” said Tony Wallbank, the Princeton, Ont. man who drove the two families to P.E.I. In P.E.I., farmland goes $1,500 to $2,500 an acre, he said. “There’s good weather, lots of small farms, laid-back people. The Amish couldn’t believe how friendly everyone there was,” he said. Scoping out the land is the start of what could be a two-year process to move several families from Southwestern Ontario to the Maritimes, Wallbank said. I’m glad they are scouting out new territory. Too many Americans have become too mean. I hope they can find what they are looking for at an affordable price. Land is so overpriced everywhere these days. Wish them the best. Amish Come Back to British Columbia! Please come back. There is lots of great farming land in the Slocan Valley and lots of places for sale. Weather is good and the valley is fertile – perfect for family operated organic farms. I know no Amish will actually read this but I’m putting the word out: Slocan Valley, British Columbia. We want you here. (Well, me, really, I’m being selfish). Amish return to British Columbia? Jennifer you never know! 🙂 I think one of the main issues with British Columbia not being viable was the sheer distance from other Amish communities, especially at the time (late 1960s) when there weren’t even any of the current Amish settlements in Montana in existence. If I had to guess, I would guess BC will see Amish again, eventually–it just might not be in our lifetimes. Don’t feel bad Erik, neither do I except I hear it’s a beautiful place…….and good for them……I think it’s really cold there tho especially right now……. I hate cold weather…it is 58 here and my furnace has gotten a work out today……just can’t stand it cold….. Very interesting,I have a friend who lives in Ontario, will give her a call and ask her if she knows……. Will have to call my friend who lives there and ask her…..never really heard her mention the Amish that much tho…..
Because of your reply I feel a little humbled into knowing a little bit of how the Amish must feel about English people visiting and being awestruck by the day-to-day lives and “differences” of their place in the world and their choices. I have volunteered in my local tourism industry for a long time and I have met lots of Americans who have told me “I love your area, I love Canada” and I’m like “So do I”, so I do get where your coming from, Kentucky Lady 717, I am thrilled you enjoyed where you where. I wondered when I first read your reply if you had actually gone to Manitoulan Island and visited there, there was an Indian Reservation last I knew (I can’t remember myself if was on the Island or not, I was like 11 and I don’t remember, I just remember a flock of native girls staring at me) and a provincially famous ferry service called the “Chi Chi Mon” (or Chee Chee Man depending on what you look at). Come back soon, there is lots to see and do in Ontario, including visiting Old Order communities. Last time my sister & I went to visit my friend who lives there, she took us to a few of the Casinos…. (not really my favorite place to go tho) but we had a nice visit…….I worked with her in Detroit and we became good friends, not going on …..not exactly sure but way over 20 yrs……..she still ushers at the Cleary (I think that is the name of it )so have you been there ? Canada's different from the US - no its not (sometimes). Amish America readership may or may not be knowledgeable of the tragedy that happened in Ottawa, Canada, involving the Parliament building and the National War Memorial on Wednesday, October 22, 2014, but I thought I’d say that this sort of event is not limited to the United States, in fact it does happen here in Canada, I don’t know why it happened, I am not going to rush to judgment of the now identified suspect, as a consumer of media and a proud Canadian I am going to sleep on it. I am not going to give away my exact location, but I know where the slain soldier came from, I know the city of Hamilton as I was born and raised there. I know the building, “The James Street Armories” (there is a longer name to the building, involving an officer’s name, but most people know it by referring to the street it is located on) his regiment was stationed out of, I’ve had friends who have served with various units out of that same building, and have had friends host pre-wedding parties in the storied facility. This evening, to the statement “Canada is so much different than Canada” sadly, I must say sometimes, because of the actions of horribly misguided and deranged individuals it can be no different (and it has happened before, innocents have been shot dead, countless women die, police officers fall victim to vengeful people) than the USA or any other country. I am sorry about the downer, I’m sorry I’ve gotten off topic (the Amish in PEI) I am saddened about this day’s events. Sorry, this is a might to serious for me as “SHOM”, but I wanted to share this somewhere. There are days when events takes down boarders and strips away faiths and we all should show solidarity with the fallen as human beings. Just an awful story. I’m sorry to hear about this, Shom. amish scout land on p.e.i. I have Amish and Mennonite friends that live in the St.Jacobs Ontario Amish country, (about 1hr from Toronto) and they have visited that area often. They said they thought it was really beautiful, and enjoy the peacefulness of the area. Maybe they have family members scouting out the area, for cheaper farm land. I know that it is very expensive here and when land goes up for sale, it bought up quickly and not always by and Amish or Mennonite families. I find it sad when I see all these farmlands turning in to residential or commercial development. I enjoy traveling those back roads and stopping at the farm stands, and getting to the know the people of those areas. Wallbank has tried moving some communities to Northern Ontario where the land is cheaper but the terrain is rugged and not conducive to mixed farming, he said. There are many reasons why Amish would thrive on P.E.I. The soil is excellent, the growing season is longer than Northern Ontario and the land prices are cheaper, said Wallbank. On Oct. 14, Wallbank and a group of Amish from Millbank Ontario made the 22-hour drive to check out P.E.I., mainly the eastern part of the Island. The Amish noticed Route 3 and Route 4 had paved shoulders wide enough for a buggy to go down, he said. Islanders made the Amish women feel very much at home and the Amish men were impressed by the courtesy of the people and the pleasant humour of Islanders, he said. It’s unusual that the P.E.I. government isn’t playing a more active role trying to convince the Amish to relocate here. The group traditionally shuns using public health care, prefers to pay their own way with prescription drugs and hospital care and looks after their elderly in their own homes. All the Amish need is a little encouragement to help three to five families get settled and then more would follow. Besides putting land back into production and providing a population boost to the province, the Amish are a peace-loving community which would stabilize agriculture and the population base in Kings County. Amish use organic farming methods and avoid pesticides. Their environmental footprint is very light. Residents in southern Kings and Queens counties remember the arrival of many Dutch and Belgium farmers who came to the area in the 1960s to grow tobacco. They were a welcome addition to the Island community and the Amish would be as well. “We’re really hoping we’ll get a sale or two in the spring and get the ball rolling,” Mr Oliver said. There have been several trips back and forth, and the article states that Amish plan to visit PEI again in May. Land prices compared to Ontario seem to be the big draw. The communities in question are Millbank and Norwich. There are some hurdles specific to PEI but also sounds like there are English people motivated to help it happen, including potential sellers of land and, according to an English person assisting the Amish, local government. The accident photo you showed of a buggy hit. It must have been a moose. Cars don’t move fast on P.E.I. And driving a buggy from Ontario to P.EI. to scout for land? Improbable! Makes a great story though!